Signature : Mutsu Aizu Ju Michiyasu. This sword belongs toJyo Jyo saku ranking. Blade length : 51.3 cm or 20.2 inches. Sori :1.3cm or 0.512 inches. 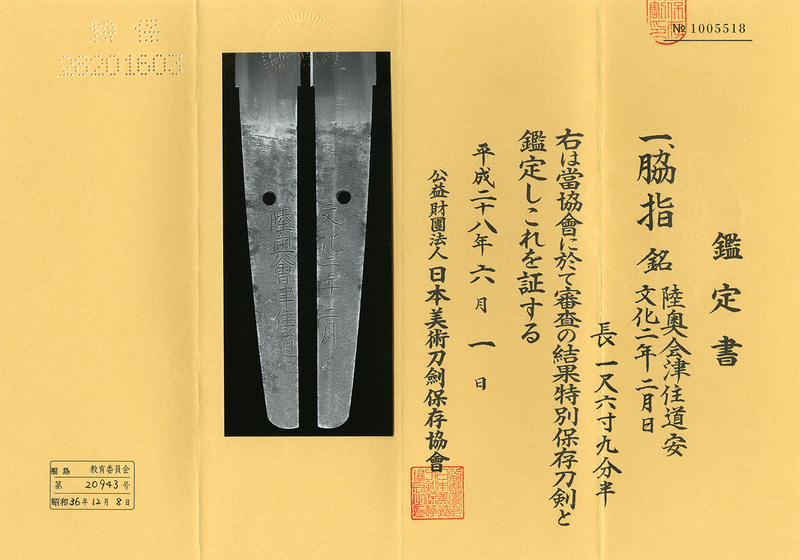 Width at the Kissaki : 2.17 cm or 0.854 inches. Era : Edo Kanbun era. with rather deep sori and longer kissaki. Shinogiji: koitame hada and masame hada mixed. Hamon :Niedeki suguha bright and clear. Michitoki and succeeded 4th generation Michitoki. and well known sword maker at Aizu province. estimated overwelmingly from Aizu samurai. clear Hamon and nice Jigane and shape.